Thousands band together across the country to help people with Parkinson’s live life to the fullest. Walkers having fun while raising critical funds and awareness at a 2018 APDA Optimism Walk! The American Parkinson’s Disease Association (APDA) officially announces the full schedule for the 2019 APDA Optimism Walks -- a nationwide movement to mobilize and inspire people to step up and help put an end to Parkinson’s disease (PD). There are one million people living with PD in the United States, with more being diagnosed every day. With 18 events across the country, the Optimism Walk series brings thousands of participants together across the country to support APDA’s mission to help every person impacted by PD live life to the fullest. By raising funds and awareness, each and every participant is helping to make a difference for those living with the disease today and to push for answers that will ultimately make PD a thing of the past. The 2019 Optimism Walk season kicks-off on March 30 with events in Coconut Creek, FL and Southern California, followed by events taking place in cities across the country including (but not limited to) Atlanta, GA; Virginia Beach, VA; Seattle, WA; Boston, MA; St. Louis, MO; Madison, WI; Warwick, RI; Chicago, IL; Westport, CT; Long Island, NY, and more! 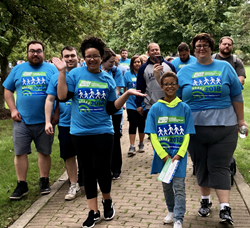 Each APDA Optimism Walk is a family-friendly fundraising event that offers a non-competitive walk (between 1-3 miles, distance varies by location), music, educational opportunities, giveaways, fun activities, and more. The Optimism Walk is an important opportunity for friends, families, and individuals who are affected by PD to come together and show support, share stories, get a little exercise, and leave feeling inspired and motivated. It’s an important chance to bond with others who are similarly connected. Corporate partners Acadia Pharmaceuticals, Adamas Pharmaceuticals, Amneal Pharmaceuticals, Lundbeck and Sunovion Pharmaceuticals have joined as National Sponsors of the Optimism Walk 2019 event series. Representatives from these companies will be on hand at many of the events to meet members of the PD community and demonstrate their special commitment to helping people with PD, families and care partners as they work tirelessly to bring innovative solutions to those living with this disease. To find an Optimism Walk in your area, visit the Optimism Walk section of the APDA website. 2019 APDA National Optimism Walk Event SeriesThe American Parkinson’s Disease Association (APDA) officially announces the full schedule for the 2019 APDA Optimism Walks -- a nationwide movement to mobilize and inspire people to step up and help put an end to Parkinson’s disease (PD).